Young gun Jack Higginson hopes the World Cup will act as a launchpad to a successful season with Wigan in 2018. The centre has flown Down Under with the Ireland squad, having qualified through a grandparent. 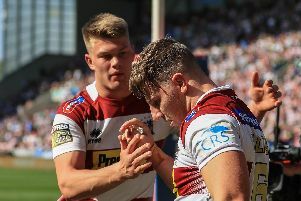 He was keen to take part in the tournament after injury limited him to just four matches last season – and none for Shaun Wane’s side. Higginson said: “Hopefully I’ll get some games over there. “It’s a good experience for me, to go to the World Cup at the age of 20. Micky (McIlorum) said he was a similar age when he went with Ireland and he loved it. Higginson broke into the Wigan team in 2016 and after making three appearances, was hoping for more first-team action this year. But a nasty hip injury ruled him out for six months. His only matches were for the reserves and on dual-registration for Workington. “My hip dislocated and went back in, but it caused quite a bit of damage,” he explained. “The surgeon said it was like a car crash, it’s a very rare injury in rugby league. Ireland have been placed in the three-team Group C, meaning only the top side qualifies for the quarter-finals. They open their campaign with an inter-group match against Wales in Cairns on October 29. They later face Papua New Guinea and Wales.